For Wikipedia's internal page on its past and present logos, see Wikipedia:Wikipedia logos. 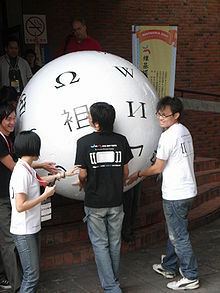 The logo of Wikipedia, an Internet-based free multilingual encyclopedia, is an unfinished globe constructed from jigsaw pieces—some pieces are missing at the top—inscribed with glyphs from many different writing systems. As displayed on the web pages of the English-language version of Wikipedia, there is a wordmark "Wikipedia" under the globe, and below that the text "The Free Encyclopedia", in the free open-source Linux Libertine font. Near the center is Latin ⟨W⟩. Above that is Japanese ⟨ウィ⟩ wi; below it are Cyrillic ⟨И⟩ i, Hebrew ⟨ו⟩ w, and (barely visible at the bottom) Tamil ⟨வி⟩ vi. To the left of the ⟨W⟩ is Greek ⟨Ω⟩ ō, and below that are Chinese ⟨維⟩ wéi, Kannada ⟨ವಿ⟩ vi, and (barely visible at the bottom) Tibetan ⟨ཝི⟩ wi. The right-most column is Ethiopic ⟨ው⟩ wə, Arabic ⟨و⟩ w, Korean ⟨위⟩ wi, and Thai ⟨วิ⟩ wi. The empty space at the top represents the incomplete nature of the project, the articles and languages yet to be added. See WP:Wikipedia logos for details of previous logos, including the glyphs used. An initial design of the logo was created by Paul Stansifer, a then 17-year-old Wikipedia user, whose entry won a design competition run by the site in 2003. Another Wikipedia user, David Friedland, subsequently improved the logo by changing the styling of the jigsaw pieces so that their boundaries seemed indented and simplified their contents to be a single glyph per piece, rather than a jumble of nonsensical multilingual text. In the process, some errors were introduced. In particular, one piece of Devanagari script and one piece of Japanese katakana were incorrectly rendered. By 2007, users on listservs discovered that the logo had some minor errors. The errors were not immediately fixed, because, according to Friedland, he could not locate the original project file. Friedland added that "I have tried to reconstruct it, but it never looks right" and that the logo "should be redrawn by a professional illustrator." Kizu Naoko (木津 尚子? 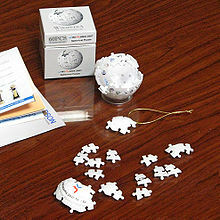 ), a Wikipedian, said that most Japanese users supported correcting the errors. In an e-mail to Noam Cohen of The New York Times, Kizu said that "It could be an option to leave them as they are. Most people don't take it serious [sic] and think the graphical logo is a sort of pot-au-feu of various letters without meaning." The new logo was rolled out on the projects in May 2010. It features the new 3D rendering of the puzzle globe, with corrected characters (and the Klingon character replaced by a Geʿez character). The wordmark has been modified from the Hoefler Text font to the open-source Linux Libertine font, and the subtitle is no longer italicized. The "W" character, which was used in various other places in Wikipedia (such as the favicon) and was a "distinctive part of the Wikipedia brand", was stylized as crossed V's in the original logo, ⟨W⟩, while the W in Linux Libertine is rendered with a single line. To provide the traditional appearance of the Wikipedia "W", a "crossed" W was added as an OpenType variant to the Linux Libertine font. ^ a b Poll, Philipp H. "New Wikipedia-Logo using LinuxLibertine". Libertine Open Fonts Project. Retrieved 2011-01-30. This page was last edited 22:49, 17 October 2015 by Wikipedia user JustBerry. Based on work by Wikipedia user Petrb and Wikipedia anonymous users imported>Kunalforyou and imported>CaroleHenson.